Quick — name the first person with artificial hips to not only compete in free style wrestling but also collect a silver medal at the 2004 USA Wrestling Far Western, a gold medal at the 2006 Gay Games and then another silver medal at the inaugural WWB Cup in 2008. His name is Roger Brigham and to reclaim his passion for sports during the long recovery process after his 2001 hip surgery, he explains he needed to basically re-invent himself. The lower body strength that had been his greatest advantage was now denied him. But Brigham has a lot of experience in successfully dealing with challenges and being inspired to bring about positive change in the process. He started scoring victories on the mat early on, from his high school days in the Midwest to graduating from Ohio Wesleyan University as a two-time letterman. He had heard of the “Gay Olympics” as it was first called until the International Olympic Committee sued over use of the word Olympics. He arrived in San Francisco ready to compete but was turned away because his late entry was “against the rules.” Even today as Brigham recounts his experience, the frustration in his voice is still apparent. He ended up not attending the wrestling events but supported other competitions instead. Decades later he was determined to help make the Gay Games as inclusive and diverse as possible so no one else would be turned away as he had been. He was one of the authors of the Federation of Gay Games (FGG) policy on drug-testing, saying “I wanted to make certain that athletes who were HIV-positive and prescribed steroids as part of their medical treatment wouldn’t be disqualified.” He’s served as chair for Wrestling Without Borders (WWB), an organization promoting wrestling on an international basis. 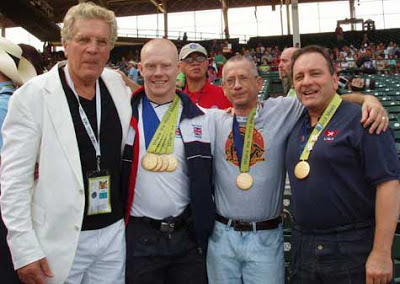 This led to Brigham being one of the WWB’s representatives to the FGG in 2003, just in time for the controversial split between the OutGames and the Gay Games. The attempt to resolve the issues that split the two groups into hosting separate events ever since is something that is still one of his concerns. Brigham was part of a coalition of LGBT sports organizations in the Bay Area who met in April to explore options. “The major differences are philosophical and managerial,” he explained. A goal of the FGG is to be more inclusive in terms of participants and the priority for the OutGames has been more on human rights. This has led to what many feel is an almost abandonment of sports in favor of workshops and organizational activities at the OutGames. One suggestion has been a joint effort by the two groups to play to their strengths, where the FGG would coordinate all sports and competitions and OutGames would supervise discussion groups and trainings on human rights and cultural activities. These days Bingham is focused on coaching rather than on personal competition. He’ll demonstrate moves and then help his trainees and students to achieve them. After joining the Golden Gate Wrestling Club in 2003, he was one of the founders of the Golden Gate Wrestling Alliance in 2007. At a time school budgets were being severely cut, the new organization worked with the City of San Francisco to use their recreational centers in doing volunteer coaching with high school students. Binham’s group “adopted” Mission High School. A few years ago, Jaime Loo, one of his young wrestlers attracted a lot of attention by coming out. In his Jock Talk column that appears in the Bay Area Reporter, Roger shared that “As his confidence grew, Jaime started coming out to teammates and coaches one-by-one. I was the last one he told. “Three years later, Jaime is still here and now I am his head coach. A wonderful support program at Mission High has made it possible for him to visit college campuses and attend sports and leadership camps. He’s a solid A student in his final year as a team co-captain and is the most gregarious and vocal team leader. Having already earned two bronze medals in the past two city tournaments, he is gunning for his first state tournament berth. And he has been coming out to people outside his team. That was back in 2011. Roger talked about how Jaime has been doing since then. “He won a scholarship to Santa Clara University, a conservative Catholic school. His coming out prepared him well. He had to do a lot of interviews about what coming out was like. That was one of the interview questions asked by a priest. He ended up with a focus on gymnastics and cheerleading which suits him well.” With a sense of pride, Bingham added that Jaime feels a obligation to give back to the sport that helped him so much and that he has been volunteering as a wrestling coach. The idea of giving it back is crucial to Bingham, not only in his direct work with students but also in his concern about providing much needed resources for other coaches. “There are resources for LGBT students and athletes,” he points out, “but there was almost nothing for coaches.” He explained how important coaches are in terms of the sustainability of a safe place for everyone involved. Students come and go as they finish school or move. But a coach can be a resource for decades in shaping a school’s approach to homophobia. This led Bingham to founding Equality Coaching Alliance to support LGBT coaches in best practices and being able to talk openly about their situations. “We have around 200 members now,” he said, “and most are still closeted.” One of their members, Anthony Nicodemo received national attention when the Yonkers high school basketball coach came out. He was inspired by Jason Collins. Bingham has two more major challenges coming up. The last week of April, he entered a hospital for heart surgery. When he recovers, he’ll be looking forward to working with an Australian wrestling group, the Sydney Silverbacks. He met them at the last Gay Games where he ended up coaching them, and they were so impressed they’ve been fund-raising to bring him to their country. Roger Brigham: Today – San Francisco: Tomorrow – the World. Update: Roger Brigham is recovering at home following his successful heart surgery.